How do you react when your toddler wants more food during a meal or snack? So what’s a mom or dad to do when there’s still plenty of other food on the plate, but the wee dictator demands more of something? And let’s be real, it’s usually the carbs they want more of! 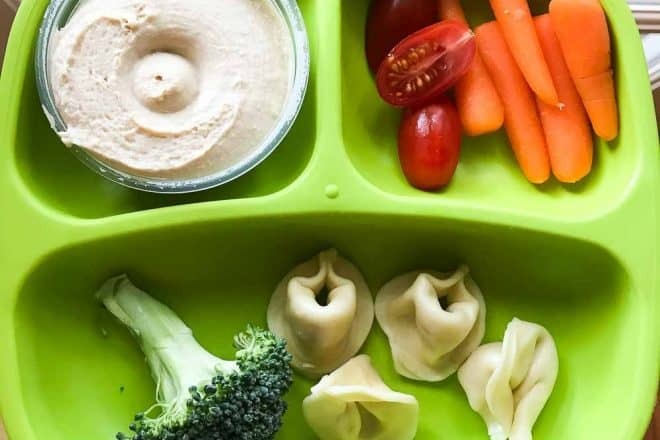 As parents, we may take it as a sign that we are not parenting correctly or effectively if our child doesn’t eat the balanced meals that we serve them. Take that pressure off of yourself! What they ultimately eat is not in your control. Here are the things that you can do when your child wants more. Young children will have varying levels of hunger every day. Whereas we as adults might be able to guess how much food we need at a meal, we aren’t usually successful in guessing how much our kids need. Factors like their growth and activity level affect their hunger. We don’t know what their body needs at any given time. They may be much hungrier than you realize, OR not nearly as hungry as you think they should be. When your toddler wants more food, let them have more — within reason. Even if you’re not thrilled that they want more mac and cheese, and haven’t touched their chicken or veggies, that mac and cheese is part of the meal you served. That means they can have seconds (or thirds) of anything that is offered. It’s not realistic to assume they are going to eat a balanced meal every time. This is when you can teach that a meal is shared, and we have to leave some for everyone else, too. Food does run out, and that’s okay. No one has endless amounts of food prepared. If we have 6 hamburger buns and 4 people, then your child has to learn that everyone needs to get one before they can have another. Serving a meal family style is a good teaching moment because they can visually see how much food is available, and see how everyone gets a chance to serve themselves a portion. What if they finish eating their hamburger bun, and they ask for another? If everyone got one, yes, they can have another. Now they finish the second one, and ask for another? You can explain that we have to give others a chance to have a second helping, too. If they would like, they can eat some of the other foods on their plate. Notice we avoid saying things like, “you can have another if you eat ___ first.” It’s important to avoid pressuring them to eat something they do not want to eat. If you want your kids to one day eat balanced meals, show them what that looks like. Serve a balanced meal on your own plate, and try to fill your plate with about half vegetables/fruit. If they grow up seeing their parents eat huge plates of pasta with a side of bread every single week, they will accept that as normal. If they grow up seeing their parents eating a variety of foods, that is more likely to become normal for them, too. Research does show that children eat more fruits and vegetables if they see adults enjoying them! And, there is nothing wrong with indulging in less healthy meals from time to time. The point here is that it shouldn’t be an everyday occurrence if you are trying to establish healthy habits. This plays into your overall feeding style. Too much control over what and how much they eat can backfire. Having a more relaxed approach and putting more trust in your little one might end some of your mealtime battles. Do you worry about the lack of nutrition in the food they want more of? Think about what you are serving at meals most of the time. If unhealthy options are creeping into meals more often than you’d like, it’s time to re-examine the meal plan. Remember, you choose what you serve. It doesn’t have to be 100% healthy 100% of the time. But if you are comfortable with the foods you serve, you’re more likely to feel okay when they want more!